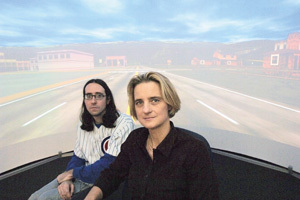 INSIGHT: Professor Daphne Bavelier (right) and graduate student Shawn Green found that playing high-action video games can improve players’ eyesight by changing the pathways their brains use to process visual information. Rochester researchers are finding surprising benefits to playing video games. First we were told that video games would turn us into couch potatoes. Then we heard that some games were addictive. Finally, the word was that they inspire violence in young people. So, there’s no question that researchers at the University are using a new 22-foot, widescreen, wrap-around TV with customized video-game hookup in the basement of Meliora Hall to determine just how bad all this game playing is, right? While University researchers are digging deeper into the effects such games have on us, the results are suggesting that the games have benefits nobody was expecting. Work by Daphne Bavelier, a professor of brain and cognitive sciences, indicates that playing high-action video games, such as the popular Unreal Tournament, can actually improve your vision by about 20 percent. In essence, playing video games improves your bottom line on a standard eye chart. One benefit to using games for visual rehabilitation is that patients are far more likely to partake in something if they enjoy doing it, and there is no question that some video games draw in people surprisingly strongly. “We think there’s a deeper theory than just the fun of playing,” says Richard Ryan, a motivational psychologist at the University and lead investigator for research published this winter in the journal Motivation and Emotion that shows the fun of playing is rooted in fulfilling some basic psychological needs. Ryan quizzed 1,000 gamers on what motivates them to play video games. He found that players reported feeling best when the games produced positive experiences and challenges that connected to what they know in the real world. Video games can provide opportunities for achievement, freedom, and even a connection to other players, and those benefits trumped a shallow sense of fun, which doesn’t keep players as interested. “It’s our contention that the psychological ‘pull’ of games is largely due to their capacity to engender feelings of autonomy, competence, and relatedness,” says Ryan. The researchers believe that some video games not only motivate further play but “also can be experienced as enhancing psychological wellness, at least short-term,” he says. Ryan and coauthors Andrew Przybylski, a Rochester graduate student, and Scott Rigby, the president of Immersyve Inc., who earned a doctorate in psychology at Rochester, aimed to evaluate players’ motivation in virtual environments. Study volunteers answered pre- and post-game questionnaires based on Self-Determination Theory, a widely researched theory of motivation developed at the University. After finding 32 select nonplayers, Bavelier and Green administered eye exams. Each student took a crowding test—a sort of electronic eye chart that measures how well they could discern the orientation of a “T” within a crowd of other distracting symbols. Students were then divided into two groups. For roughly an hour a day, the experimental group played Unreal Tournament, a first-person shoot-’em-up action game in which players act as soldiers in a highly stressful futuristic war. The control group played Tetris, a puzzle game equally demanding in terms of motor control, but visually less complex. After about a month of near-daily gaming, the Tetris players showed no improvement on the eye test, but the Unreal Tournament players could tell which way the “T” was pointing much more easily than they had just a month earlier. These results suggest that people with visual deficits, such as amblyopic patients who suffer from a dimness of vision, may also be able to gain an increase in their visual acuity with special rehabilitation software that reproduces an action game’s need to identify objects very quickly. Bavelier and other researchers this summer expect to begin using a new video lab with a 22-foot screen to take their research to the next level. The Virtual Reality Laboratory sports a giant 180-degree screen and a bevy of special 3D equipment that will not only create the illusion of three-dimensional objects for research subjects, but even allow them to be felt and manually manipulated. Special glasses and gloves will immerse players in a virtual world where scientists can change the laws of nature, such as making gravity push upward, and study with precision how our brains adapt. When the lab is completed, Bavelier plans to delve even further into how other areas of our brains respond to video games. No doubt there are avid gamers on campus who have already heard of the ultragaming lab—and you don’t need to be a scientist to guess how their brains are already responding. Jonathan Sherwood writes about science for the Office of Communications.